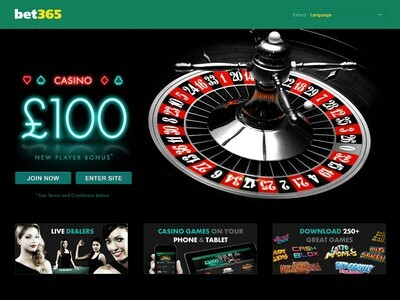 bet365 Casino is powered by downloadable and non-downloadable Playtech software. Register a new account here and you will automatically qualify for a limited-time-only welcome bonus. The usual welcome bonus is a 100% match worth $/€/£100, but for the release of their new-look casino, they are offering new players a 100% match worth $/€/£150, using bonus code: BONUS100. Registered members can also take advantage of the epic $/€/£3,000 Bonus Bundle. Players can contact the customer support here 24 hours per day via Email, Call Back, Telephone, Fax, Post and Live Chat. The telephone support is toll free. This trustworthy online casino can be displayed in multiple different languages, it is licensed Gibraltar and it is owned by the largest betting operator in the UK, Bet365 Group Limited. Some of the most popular titles here include (progressive and non-progressive games): Gladiator, Premium Roulette, Thor, Plenty O' Fortune, Everybody's Jackpot, Live Blackjack, Funky Fruits, The Sopranos, Live Baccarat, DOND World Slot, Multi Wheel Roulette, Spamalot, Frankie Dettori's Magic 7, Jacks or Better, Mr Cashback and Captain America (scratch card). Other Live Dealer Games include Live Roulette, Live Casino Hold'em and Live Sic Bo (with European and Asian Live Dealers). bet365 Casino is literally packed with exciting promotion offers and it has one of the best VIP loyalty schemes available online today. Popular online casino methods that are accepted here include Visa, Maestro, Laser, MasterCard, Visa Debit, NETELLER, Skrill, PayPal, Instadebit, Click2Pay, Ukash, paysafecard, entropay, Bank Wire, Fast Bank Transfer and Cheques. This is one of the most advanced online casinos in the world and it is also one of the most trusted online casinos available for players today.